The woman behind the sitcom Little Mosque on the Prairie has turned to a new creative outlet — fashion. Zarqa Nawaz and her business partner have launched a clothing line to fill a gap that she noticed while producing the set-in-Saskatchewan comedy. Nawaz says the purpose is to give women fashionable clothing that isn’t overly sexualized but isn’t frumpy either. She says the idea came when she was a producer on the TV show. The main character of Little Mosque, Rayyan, was the first hijabi character on TV, but they had a hard time finding clothing for her. Nawaz had a designer come on set to design all of the clothing, but always thought it should be easier for women generally. Jumping forward a few years, she connected with Rubina Surtie to create Zarquby. Surtie focuses on the logistics of the business while Nawaz picks the clothing and builds the brand. 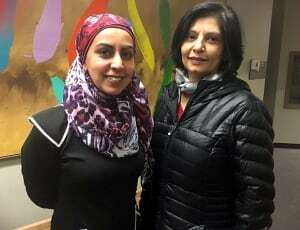 “I saw it [the need] not only from the Little Mosque perspective but also for myself and other Muslim women that still want to dress modestly,” Surtie said. They also say they don’t want to be known as just a Muslim brand, noting that their first sale was from a person who was not Muslim. They started building their business about six months ago, and showed their line at an Islamic conference in Toronto over the Christmas holidays. In recent weeks it’s been picking up steam. “Half our stock is already sold out,” Nawaz said. Both women laughed at that. “Very modest goals,” Nawaz said.